When you first set up the iPad, you have the option of turning on Siri. If you did so, you’re good to go. If you didn’t, tap Settings → Siri, and flip the switch on so that green is showing. You get to train Siri to your voice, a simple process. Siri requires Internet access. A lot of factors go into accuracy, including surrounding noises and unfamiliar accents. And you also need to be comfortable with the fact that Apple is recording what you say. You can call Siri into action in a few ways. The traditional way is to press and hold down the Home button until you hear a tone. Pretty simple, eh? Siri will then listen for your query. Start talking, and your question appears on-screen. Siri is eager to respond. You can also summon Siri by merely saying, “Hey Siri.” And yes, this is Apple’s answer to the “OK Google” voice command on Android devices. To take advantage of the Hey Siri feature, on iPads prior to iPad Pro, you have to connect your tablet to power. On the iPad Pro, you can use Hey Siri without plugging in your iPad. Siri also responds when you press a button on a Bluetooth headset. Having Siri turned on is a prerequisite to using dictation on your iPad. What happens next is up to you. You can ask a wide range of questions or issue voice commands. If you didn’t get your words out fast enough or you were misunderstood, tap the microphone icon at the bottom of the screen and try again. Siri relies on voice recognition and artificial intelligence (hers, not yours). The voice genie responds in a conversational (if still ever-so-slightly robotic) manner. But using Siri isn’t entirely a hands-free experience. Spoken words are supplemented by information on the iPad screen. Siri seeks answers using sources such as Bing, Wikipedia, Yelp, Yahoo!, Open Table, Twitter, and WolframAlpha. 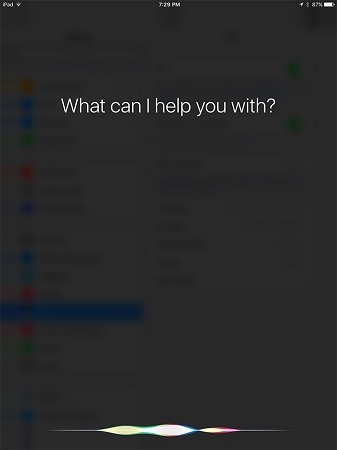 You can unleash Siri as a search agent. For instance, ask Siri to find all the videos you shot at your kid’s graduation party and she’ll oblige (at least if you tagged them correctly). Siri on the iPad can also launch apps — Apple’s own as well as third-party apps. Indeed, from your contacts, Siri might be able to determine who your spouse, coworkers, and friends are, as well as knowing where you live. You might ask, “How do I get home from here?” and Siri will fire up Maps to help you on your way. Or you can say, “Find a good Italian restaurant near Barbara’s house,” and Siri will serve up a list, sorted by Yelp rating. Using Open Table, Siri can even make a restaurant reservation. As part of iOS 10, Apple opened up Siri to third-party app producers. For example, you can have Siri arrange a ride through Uber or Lyft, or pay a debt on your behalf through apps such as Venmo or Square Cash. If you ask about a favorite sports team, Siri will retrieve the score of the team’s last game or the game in progress. And if you’re rummaging through a longish email that you can’t quite get through at the moment, you can have Siri set a reminder for you to follow up later in the evening.